Jellyfish are amazing creatures. Come along and see all of their amazing features, life cycle, and food. This is a picture of a Cephea Jellyfish. This is a picture of a glow in the dark jellyfish. 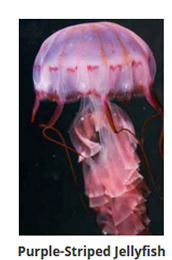 This is a picture of a Purple Striped Jellyfish. 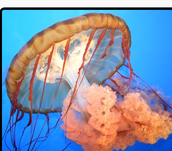 Jellyfish use their tentacles to sting and poison prey.They eat plankton, fish eggs and young fish.They use their tentacles to bring their food to their mouth.But jellyfish have to be careful because tuna, sharks, swordfish, sea turtles and some species of salmon eat jellyfish. Jellyfish begin as tiny eggs.Then their mother carries the eggs until they hatch. They are now called larvae. After they have hatched they attach to a rock until they can swim on their own. Did you know some jellyfish can be bigger than a human!Also jellyfish have been around before dinosaurs!Scientist have found 2,000 different types of jellyfish! Tentacles=A thin and flexible arm that only some animals have. Invertebrate=A animal with no bones. 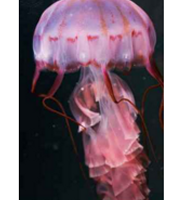 Larvae =The second stage of a jellyfish's life cycle . Plankton=Tiny animals that float in the open ocean.